How to Calculate Production of Cutting Department? Production of cutting department is the total quantity of pieces cut during the day. There are number of tasks that are performed in the cutting department. To the factory manager (or production manager) cutting production report should include style wise and color today production quantity. But to a cutting manager cutting production means how many pieces have been completed in each task. Common tasks of a cutting department include bundling, Fusing, issuing cutting to sewing department, issuing cut panels to printing section for printing and issuing cut panel to embroidery department etc. cutting manager need to keep detailed records of cutting room production. Cutting department maintain logbook or register for keeping records of each of the task done by department employees. To prepare production report of a cutting department prepare a data collection format. Cutting department use layer report (Lay slip) where you can find layer wise cutting quantity of all styles. For an example, I have shown a sample cutting report in the following image. In the following example, style wise and color-wise cutting quantity has been recorded. You can even extend this report by adding cumulative production of till date and balance cutting to be done. 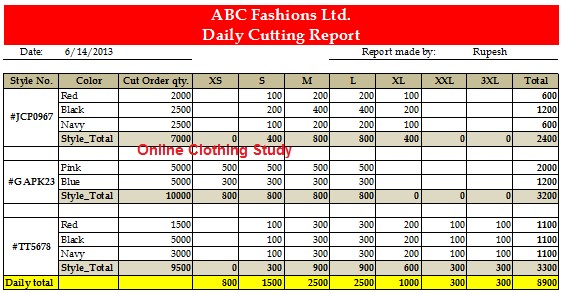 Online Clothing Study: How to Calculate Production of Cutting Department?